1. Make sure you’re pinning things that are likely to be re-pinned. That’s how other people see your content. Take a look around Pinterest and become familiar with that other people are interested in. Statistics show that users are more likely to share vertical images with visual interest. What does visual interest mean? It means the image follows some of the basic rules of good composition; there’s a clear subject, there’s balance in the photograph, sometimes there are repetitive shapes or interesting angles that direct the eye. And colorful images go a long way on Pinterest, so don’t be afraid to share images with great color combinations! 2. Use hashtags and keywords. They help people find what they’re searching for. If you want someone to find images that feature do-it-yourself projects, tag them #DIY so they’re more searchable. And make sure you use keywords in your descriptions. It doesn’t have to be a list of words; you can use a sentence or two to describe the image. For example, a great caption for the photo below would be “The floral wallpaper in this office looks great with the white desk and Eames-style chair. 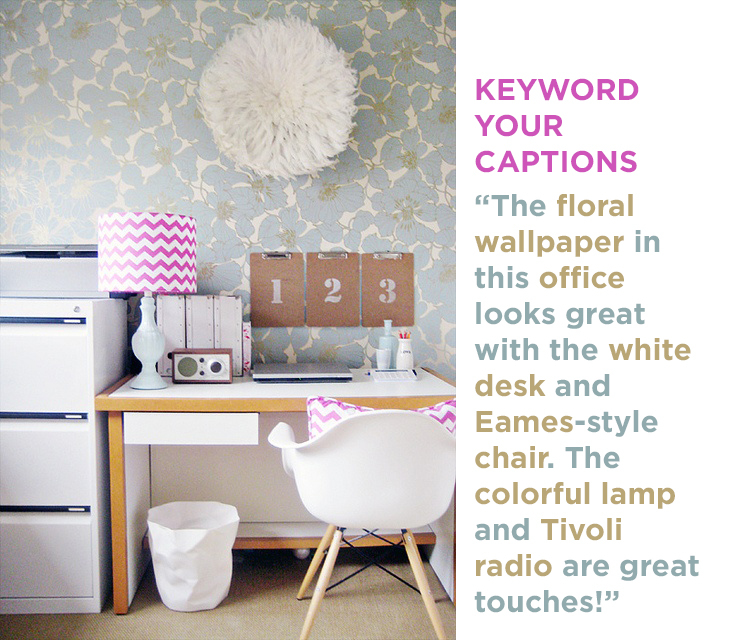 The colorful lamp and Tivoli radio are great touches!” because it’s packed with keywords people are likely to search (floral, wallpaper, office, white, desk, Eames, chair, colorful, lamp, Tivoli radio). 3. Take it easy with the self-promotion posts. Pinterest is a place for people to share the things that are inspiring, and it’s a great way to get people to your site organically, but you’ll find very few people are interested in your content if you’re only promoting your own site. Interact with people by following them, re-pinning, commenting, and liking images you like. It’s social media, after all. Make sure you’ve got a good mix of your content, original content from other places on the web, and shared content you’ve re-pinned from other users. That’s how you play nice and get more followers! 4. Keep things fresh. Share content at different times during the week. Start new boards. Collaborate with others on shared boards. People want to follow someone who is sharing a lot of new content, and they’ll be more likely to share your posts when you’re in their feed a lot. When you’re visiting someone’s profile page, you’ll see in the top right corner the three users they pin the most content from; people pay attention to this! If I find a user I like, I typically check out those other three people and follow some of them. 5. Don’t upload photos directly to Pinterest. Instead, upload them to your site first, then pin them to your boards. That way traffic goes back to your site and gives people the opportunity to explore. Consider adding a ‘Pin it’ button or plugin to your site so it’s easy for those browsing your site to share it with their Pinterest followers. 6. Check your progress. Pinterest just rolled out a new business pages feature, but you can still track your pins with a simple query in your browser. Type “pinterest.com/source/yourwebsite” into the URL bar, and replace ‘yourwebsite’ with the address from your site. Omit the ‘www’ part. For example, to view all of the pins from the Bosshardt site, you would type in “pinterest.com/source/search.bosshardtrealty.com”. Now that you have the basics down, check out our Pinterest page and follow us! Re-pin some things. Leave some comments. Follow some of the people we follow, and get ready to have some fun.